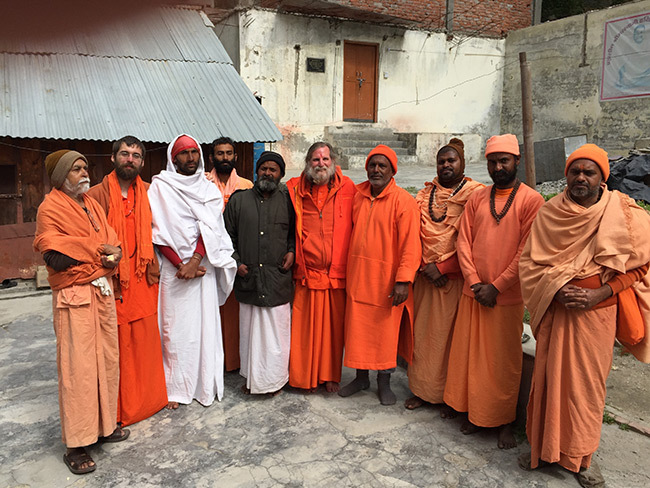 From Haridwar, we traveled to Uttarkashi, where we would make our base camp. 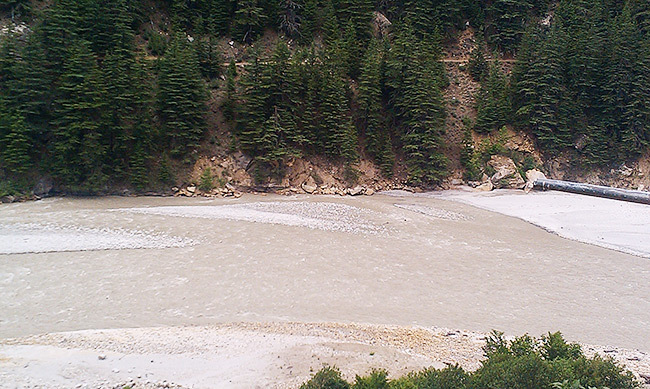 Uttarkashi, located in the Himalayas, is further north than Haridwar and Rishikesh. It is a wonderful place to perform sadhana. 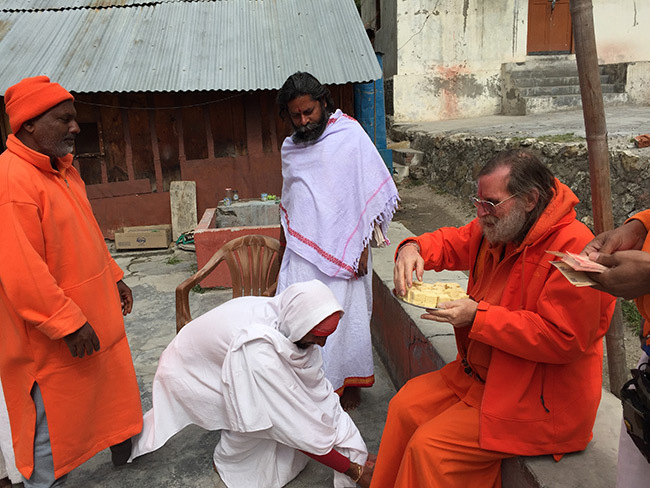 We used the opportunity to increase the length of our asana by performing Bhagavad Gita and Chandi together each morning, and then reciting various sahasranams and other texts in the evening. Each day we added a little more to our recitation. It was such bliss to lose ourselves in worship that we just wanted to do more and more. 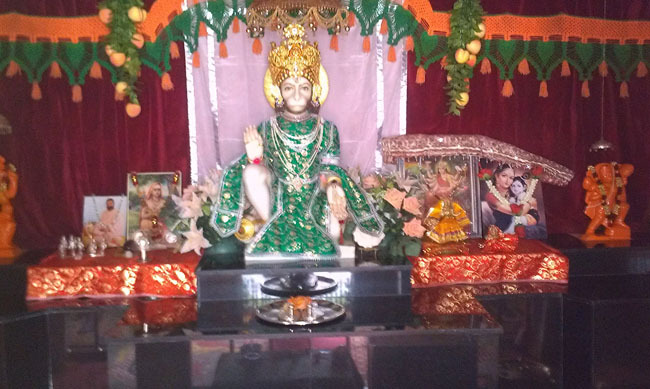 We had begun with the Bhagavad Gita and the Chandi Path, as we recite it on Sundays at the Devi Mandir. Every day we added more parts of the Chandi Path until we recited both books from cover to cover together in one asana. 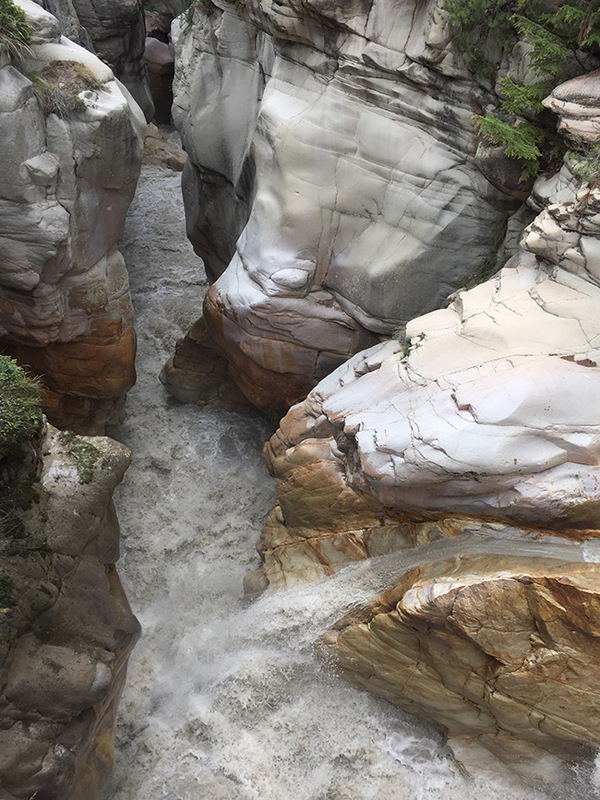 Even though it would seem unlikely, Uttarkashi has a very good internet connection and so it is the perfect place for us to get our broadcast working properly. Several times we were able to broadcast our whole morning asana of Gita and Chandi – more than four to five hours! 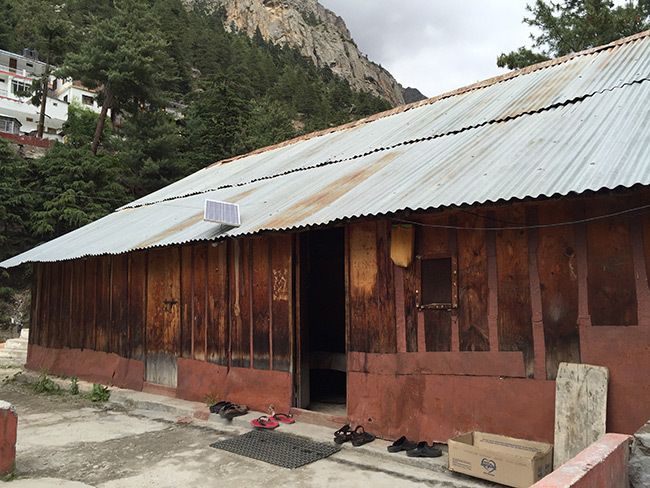 We stayed in Uttarkashi for four days. 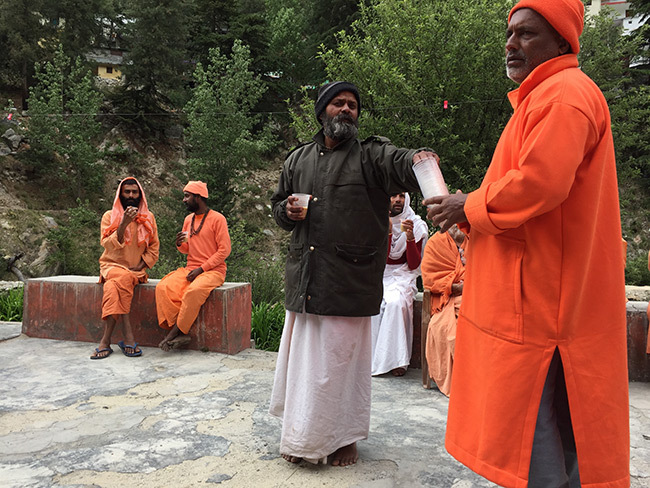 On the morning of the fourth day, after completing our morning sadhana, we began our journey further north to Gangotri. 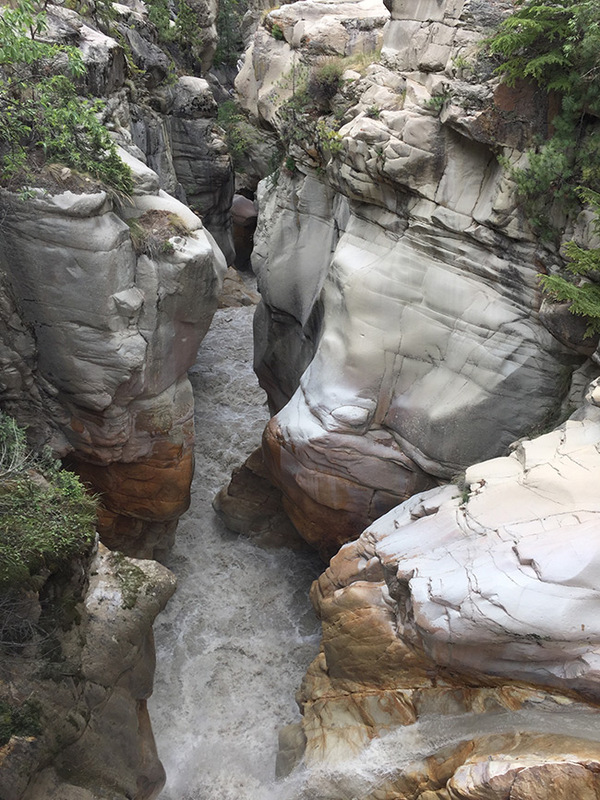 The road from Uttarkashi to Gangotri takes the same path as the Ganga, and there is nothing but trees, mountains, and the river along the journey. 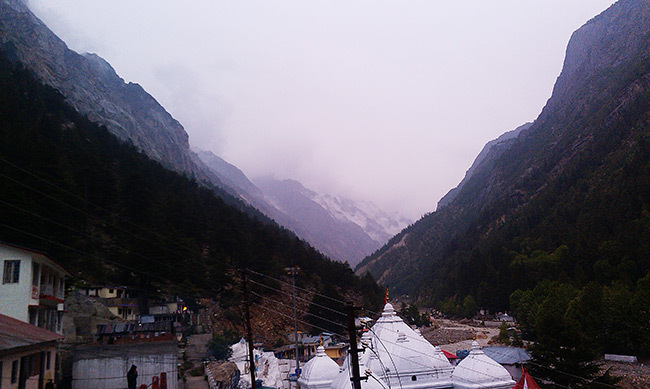 We reached Gangotri at around 5 pm. Gangotri was beautiful. 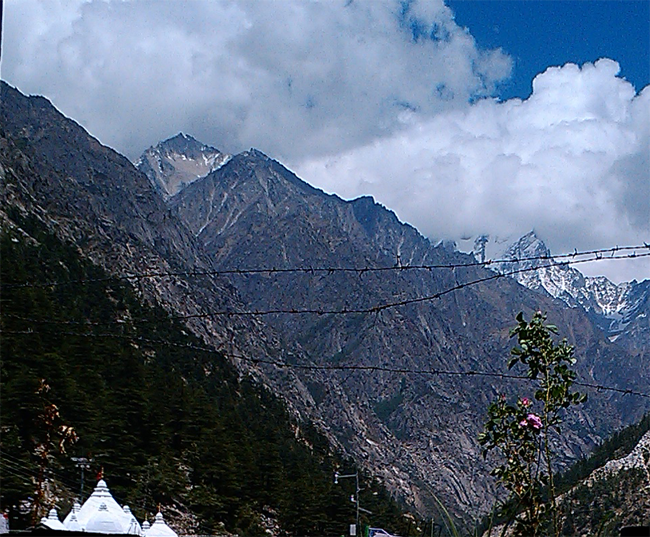 The scenery was so enchanting with the mountains and the Gangotri Mandir within our view. It will definitely be an inspiring place to perform sadhana. 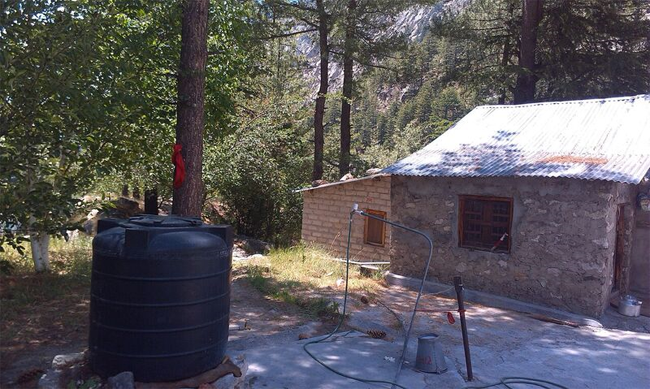 One beautiful sight in Gangotri is the Surya Kund (kund means pool). 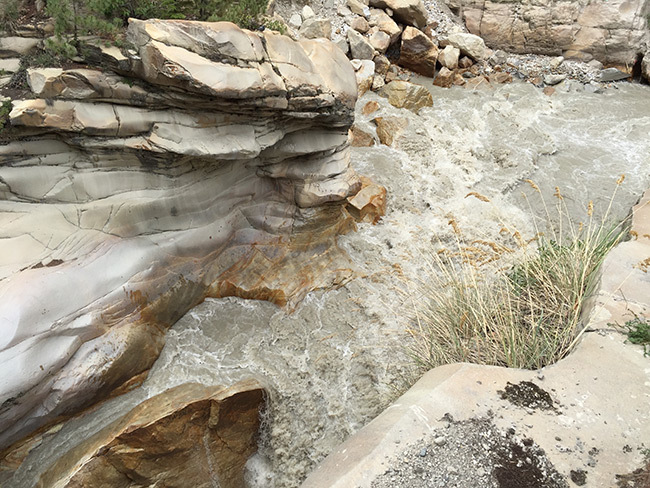 The Ganga rushing over the rocks made the Surya Kund look more like an Impressionist painting than an actual river. 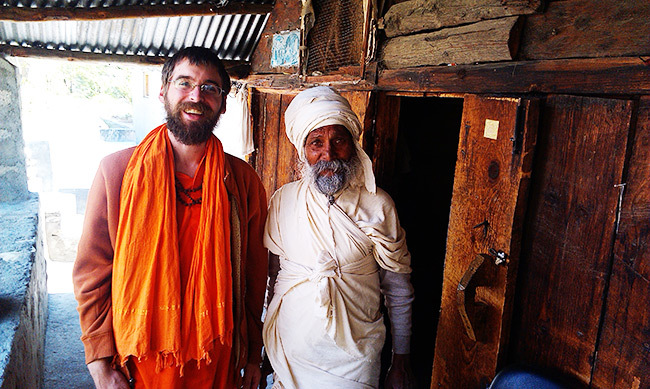 We stayed at the Ishavasyam Ashram which has a small Hanuman temple where we chanted shortly after our arrival. 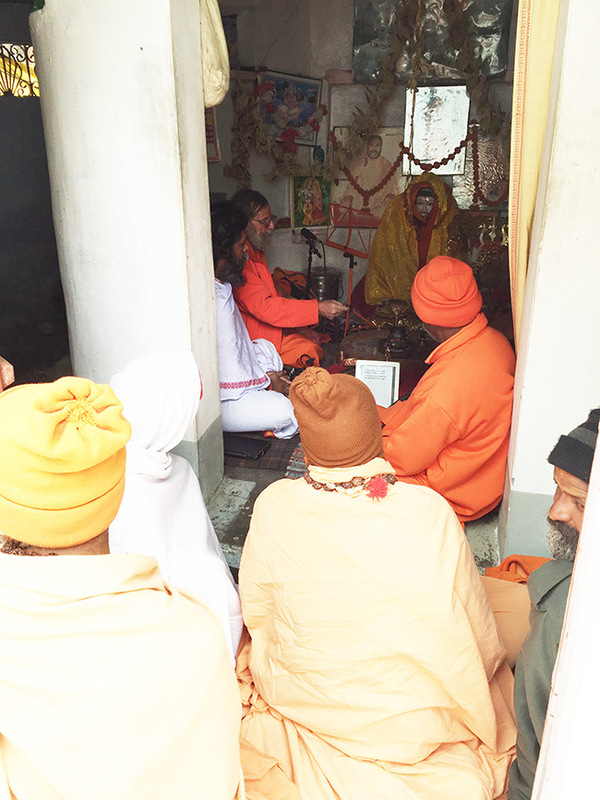 The humble pujari was very happy with us performing sadhana there. 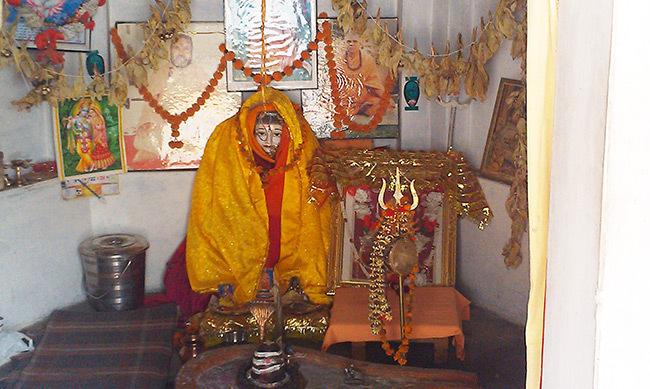 Gangotri proved to have an even better atmosphere for sadhana than Uttarkashi. 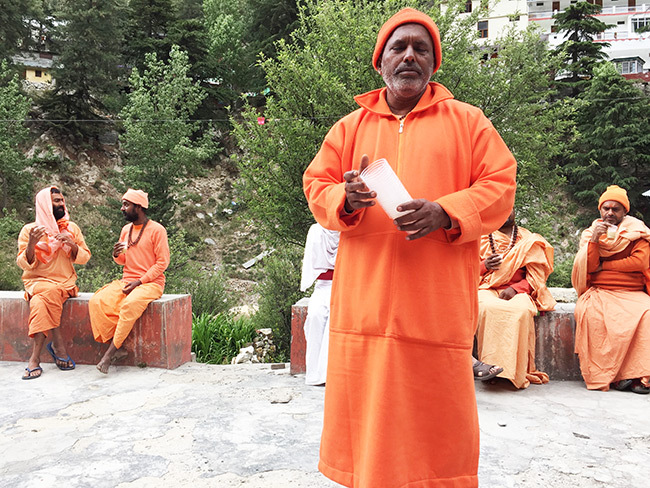 We asked the pujari when the temple opened each morning. 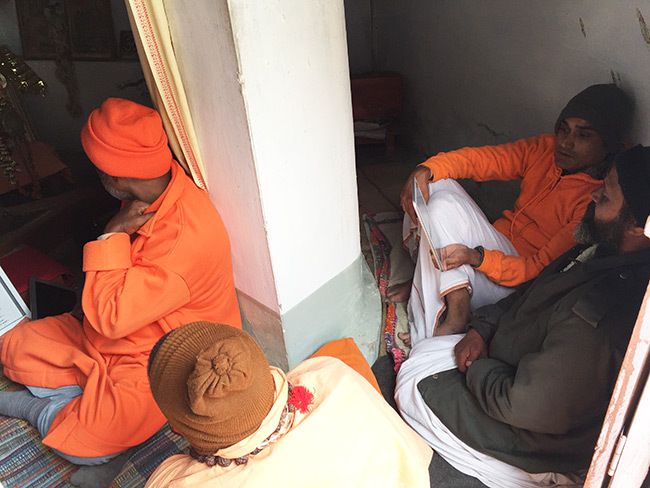 He told us that the morning arati ends around 7 o’clock and after that we could chant there as much as we liked. We knew that this would be too late for us to begin our Gita/Chandi sadhana, so the next morning we found a place to sit outside overlooking the Ganga. As we chanted the introductory mantras, I was drawn to look again and again at the majesty of the mountains and the powerful flowing waters of the Ganga. 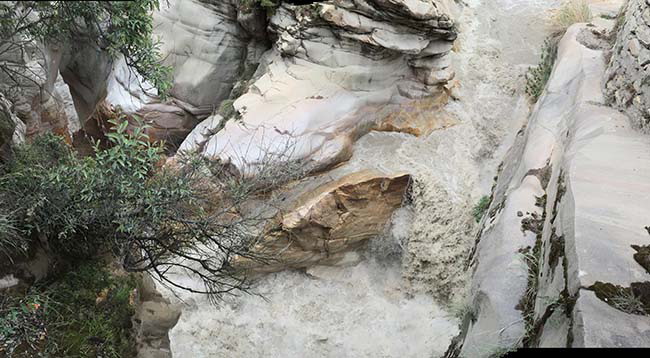 One could feel God’s presence manifested in the natural world. 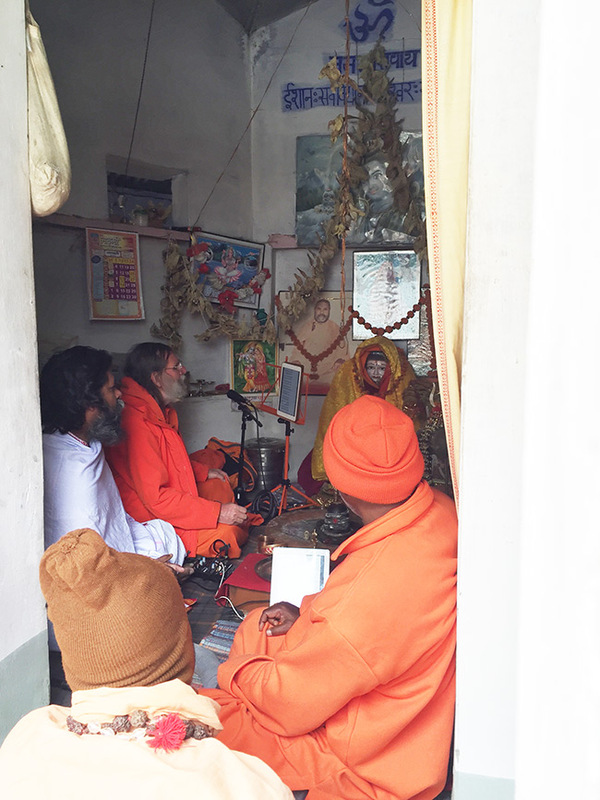 The roar of the Ganga was so loud, that we setup a microphone for Swamiji, so he could match the tone of his chanting to the tone of the rushing waters of the river. 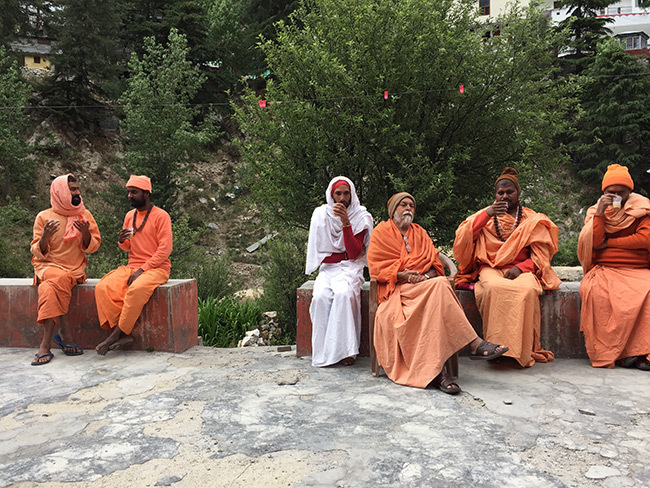 In the afternoon, Uttam, a sadhu and devotee of Shree Maa and Swamiji, took us on a parikrama (circumambulation) around Gangotri. 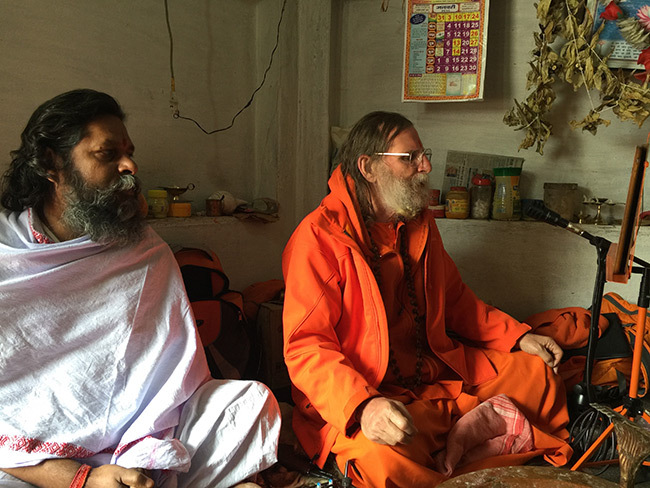 Along the way, he took us to see his room, which was a small, cave-like structure, but felt perfect for a Sadhu. Looking out his small door, you could see beautiful snow covered peaks of the Himalayas. 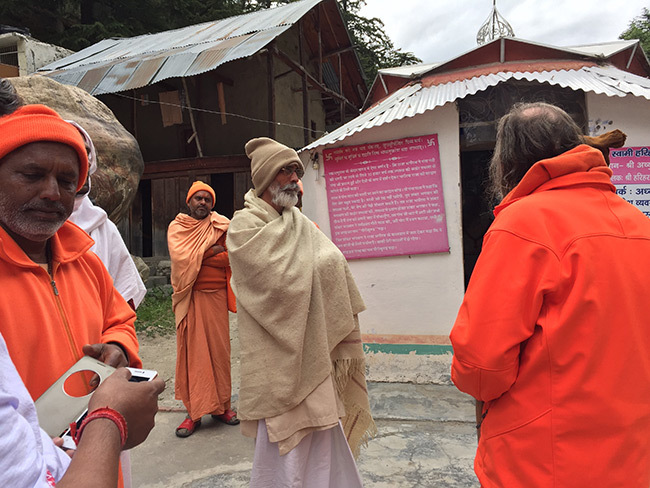 During our parikrama around Gangotri, we stopped at the Harihara Ashram. 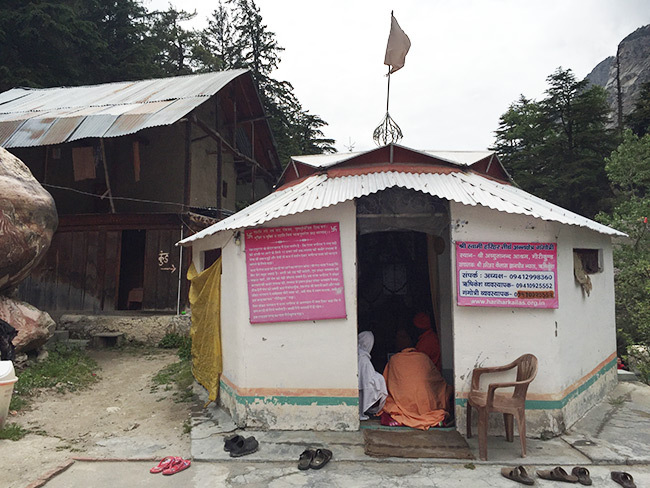 It is a small ashram where about a dozen sannyasis live. 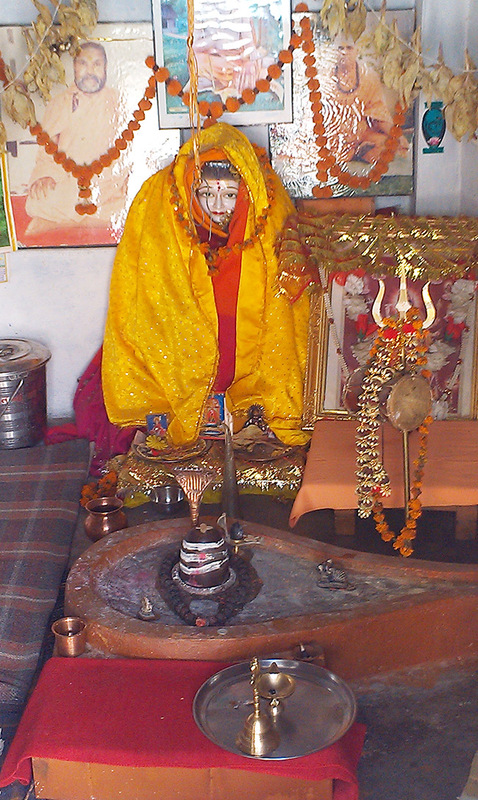 The buildings are simple constructions with tin roofs and there is a small Shiva Temple in the center of the ashram. 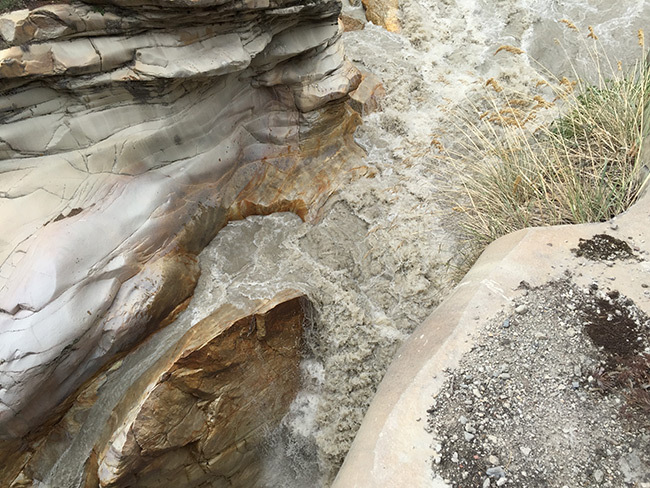 Nearby the Ganga flows and comes to a particularly beautiful point called Gauri Kund. 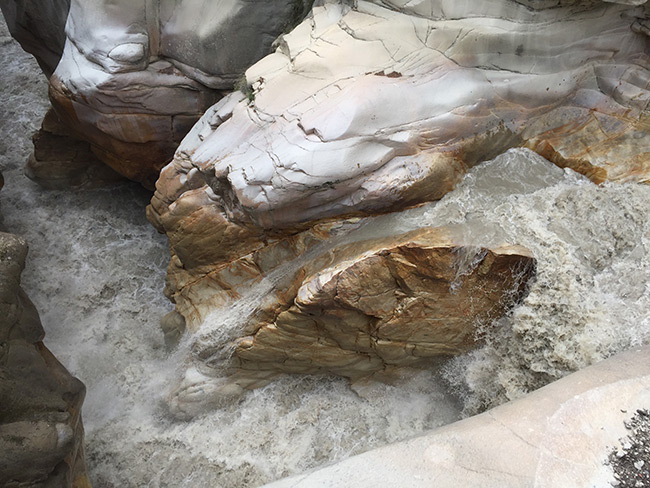 The rocks at Gauri Kund have been smoothed by the flow and force of the water, and the water slides across their smooth surface like a funnel, making a small waterfall. Swamiji sat and talked with the sadhus there for some time. Everyone there was expressing the greatest humility. When they sat together with Swamiji to talk, instead of it being a race to the top to make oneself the biggest and most important, it was a race to the bottom! Each person would only point out the greatness of the others in a sincere way. It made for a sweet and loving atmosphere as they sat together in satsangh. 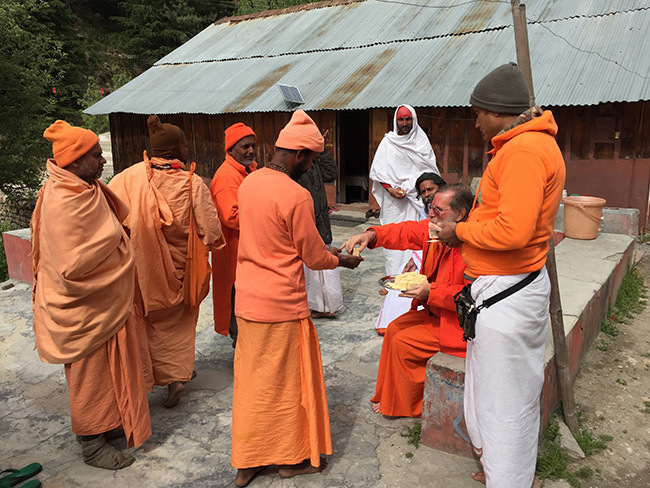 They sincerely wanted to offer something to Swamiji, but Swamiji said, “I only want your love and blessings, that alone is the best offering.” They all smiled and laughed, and continued to request Swamiji to take some tea or fruit. 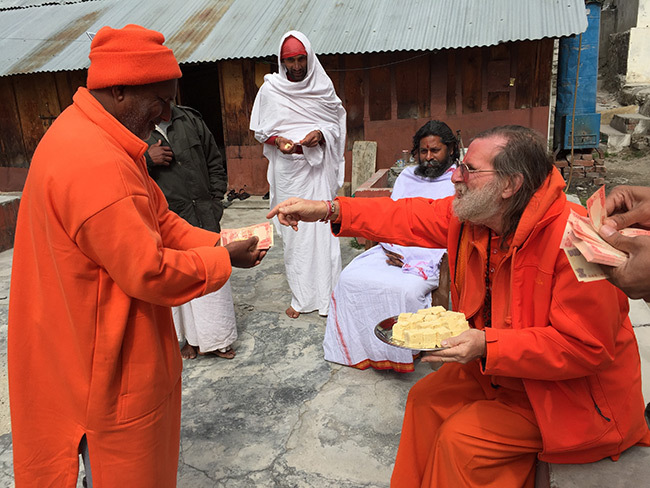 Eventually Swamiji ate a little fruit to respect their request. They were very glad. 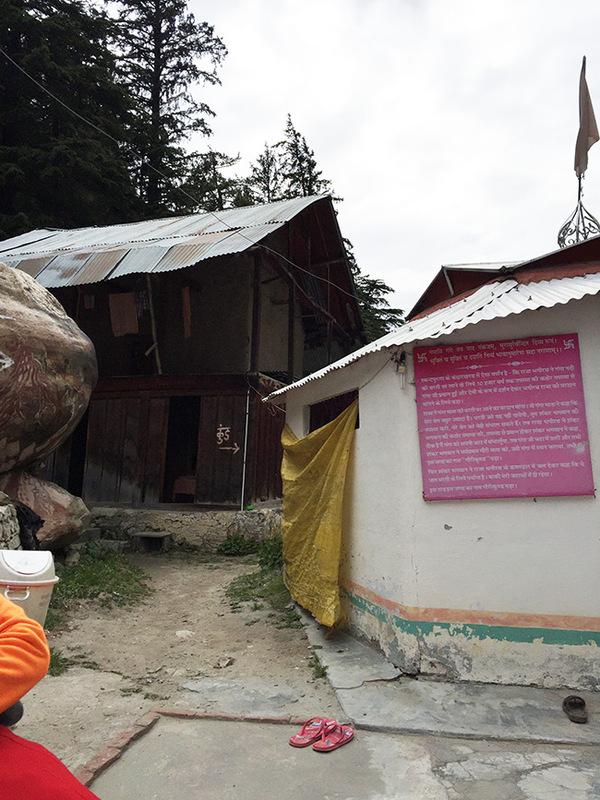 After walking around most of Gangotri, we finally came to the Gangotri Mandir. They open and close the Mandir at different times during the day. We were fortunate to have come just 20 minutes before they would open it again. When they opened it they allowed all of us inside to take darshan of the murti of Mother Ganga. Many people were there waiting to give their respect to the image of Ganga. 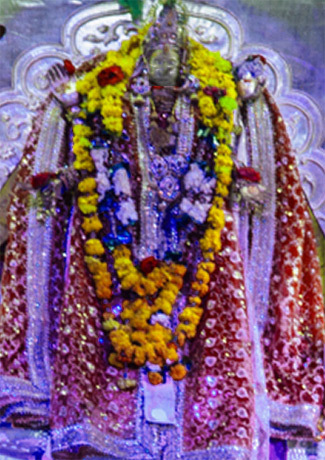 Seeing the murti of Ganga Maa, I thought of the rishis of old, whose love of God was so great that they found him and worshiped him in every form they saw. To see God in the rivers, the mountains, and the sky is truly a beautiful and inspiring sentiment. The next day we again awoke early in the morning to begin our recitation of the Bhagavad Gita and Chandi. 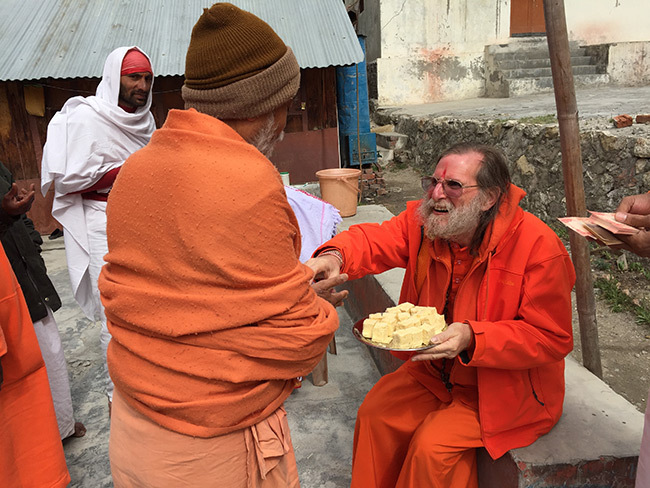 When we finished worship, we ate breakfast, gathered our things, and made our way back to the Harihara Ashram where we had visited the previous day. 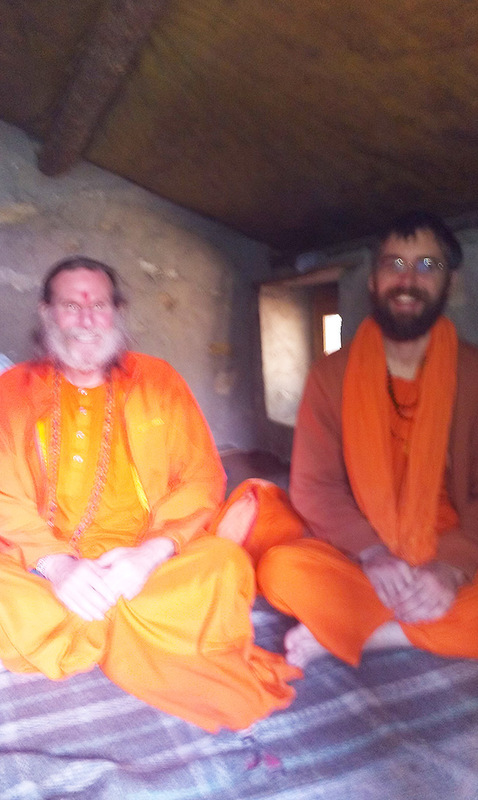 Swamiji wanted to chant in their Shiva Mandir. 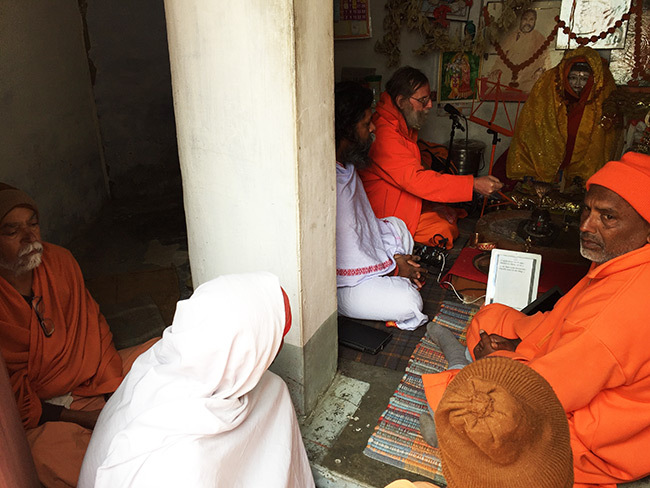 As soon as we came, the sadhus welcomed us back and invited us to do whatever worship we liked inside the temple. 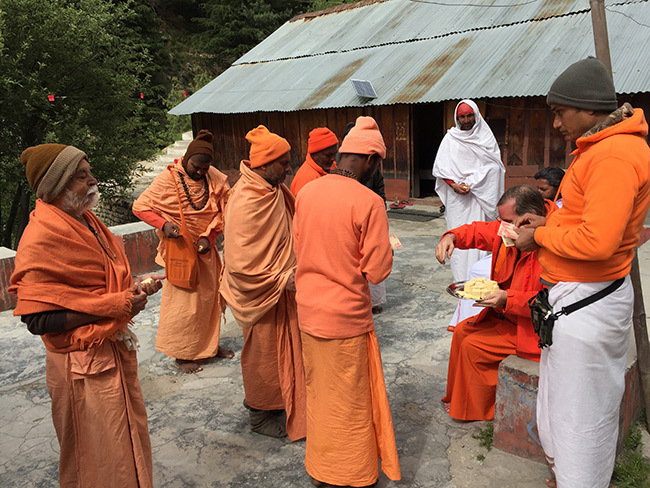 It was a divine setting for worship with the Ganga flowing close by, the mountains surrounding us, and in an ashram with fellow sadhus. We sat down in the temple and set up our broadcast equipment and mic. 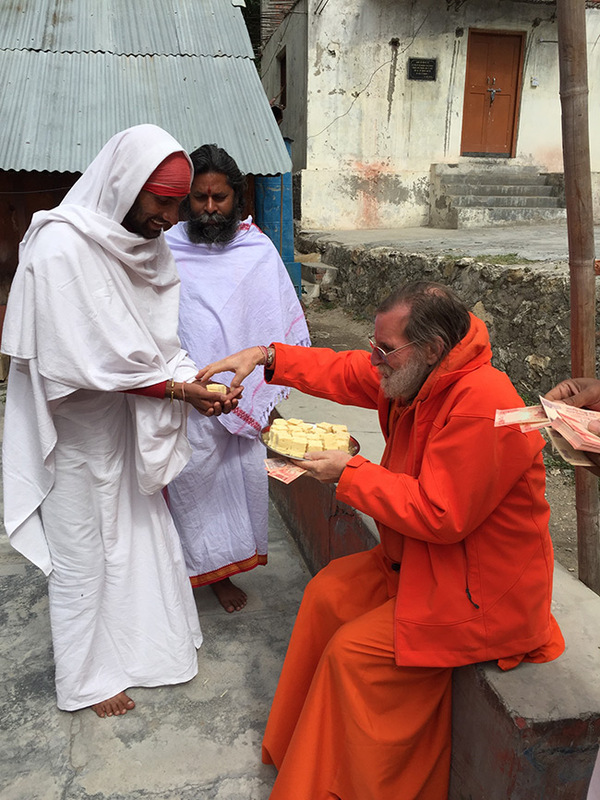 The head of the ashram, Swami Atmananda, was very surprised to see all of our equipment. We showed him the computer with the broadcast equipment and he was quite impressed. We began the Shiva Puja. 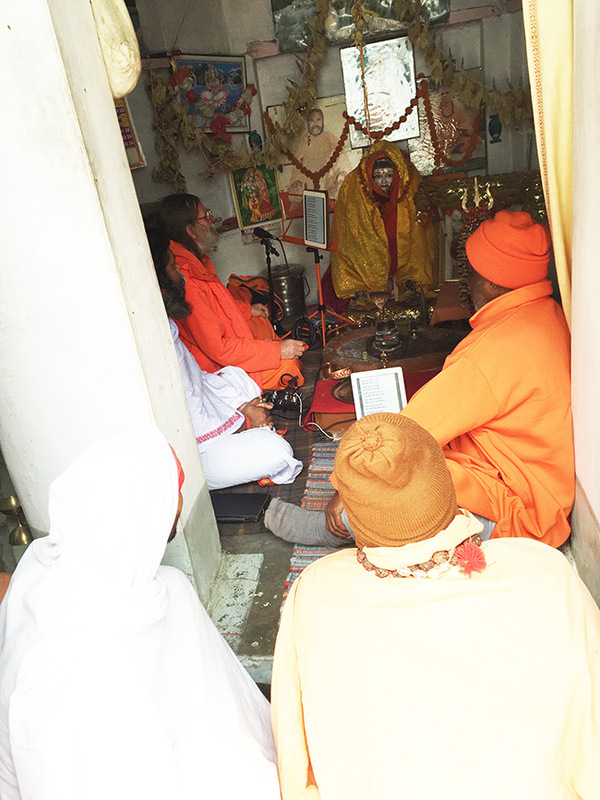 I gave my iPad to Swami Atmananda so he could worship along with us. 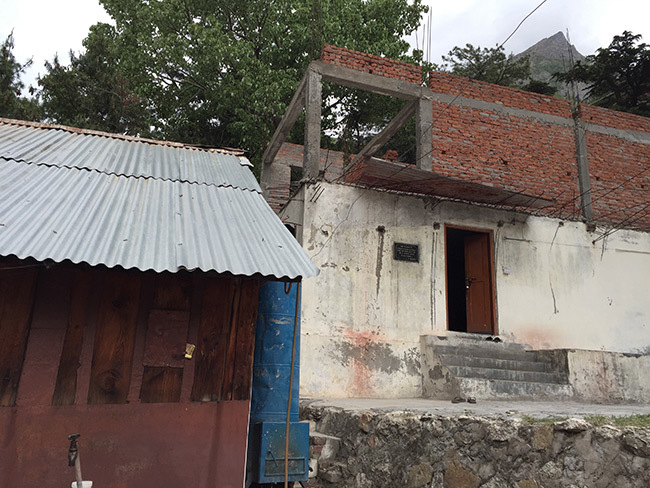 It is a small ashram of maybe ten or so people. 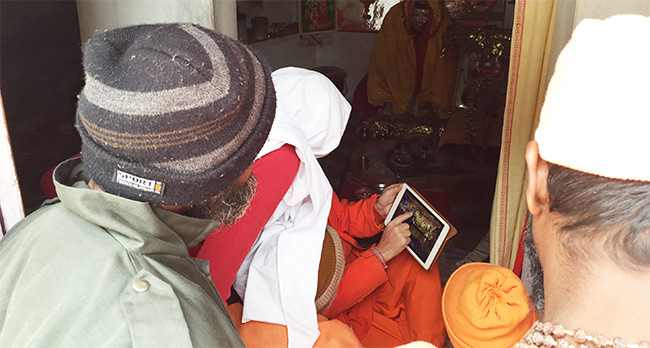 Everyone there could easily hear our chanting and soon the small temple was packed with the residents of the ashram all peering in to look at the mantras on the iPad. It was so much fun to watch them chanting from the iPad! Indeed, they enjoyed it to! 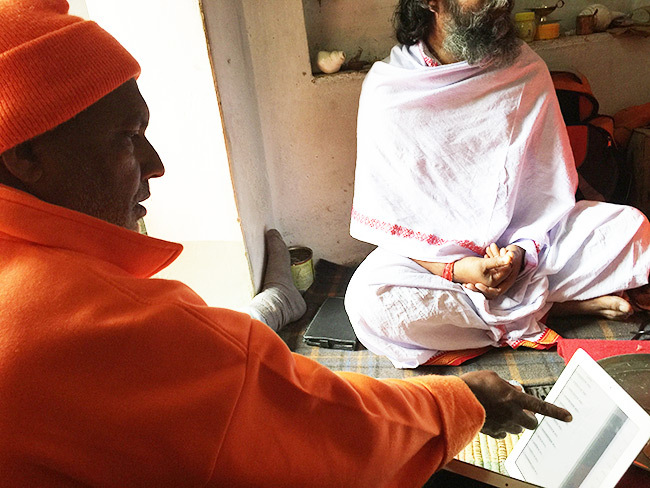 Swami Atmananda quickly caught on with the iPad and took over turning the pages. Some others who couldn’t see sat meditating and listening. It was so wonderful and joyful; everyone was there just to sing to God. It was a beautiful feeling to be in the middle of such a satsangh. 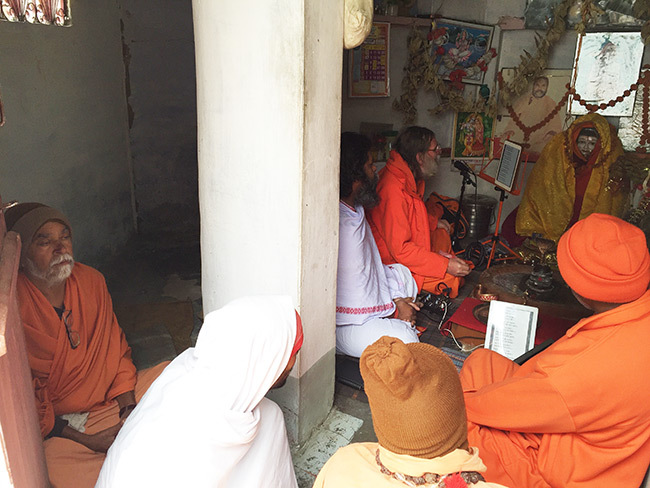 Though the buildings were old and humbly constructed, the devotion was brilliant and new! 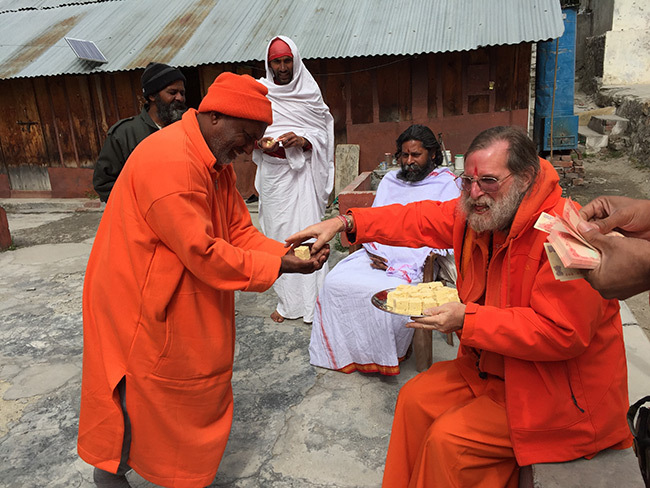 Swamiji agreed and each sadhu came one by one to take prasad from Swamiji. 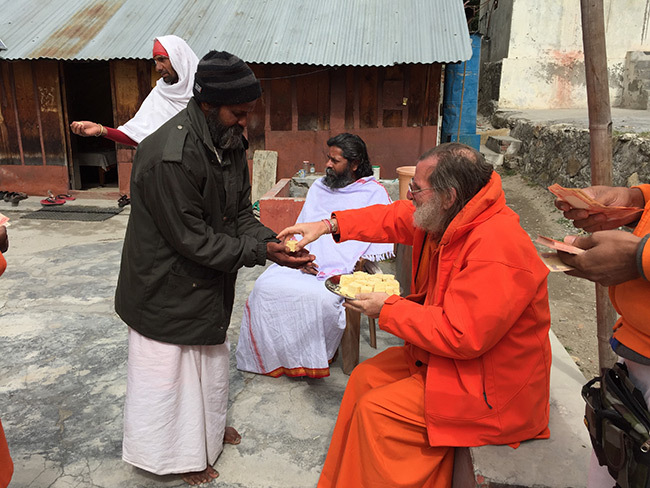 Swamiji offered them each sweets and dakshina and they all received it joyfully. Afterwards we all took photos together, and they requested us to please drink refreshments with them. We all sat together enjoying the serenity of that ashram in the unity of the divine. 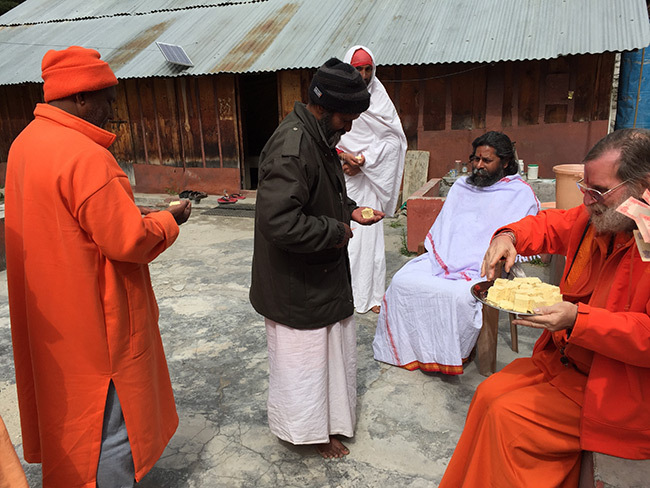 Swamiji then pulled out his iPad and started showing them pictures of our own Devi Mandir. 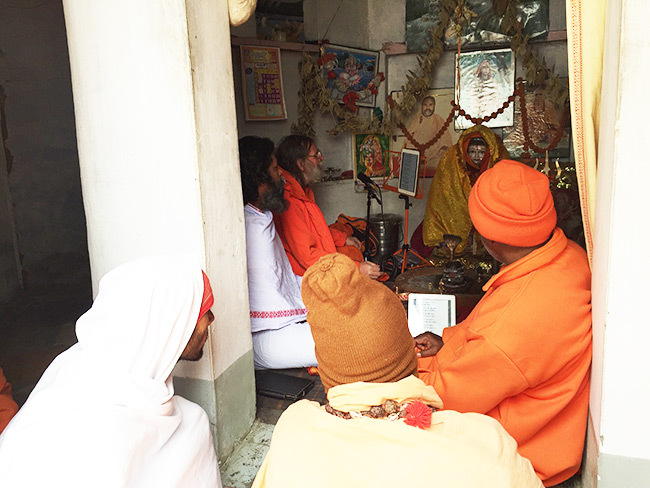 Listening with rapt attention, the sadhus gathered around Swamiji when he started to explain our various apps and books. 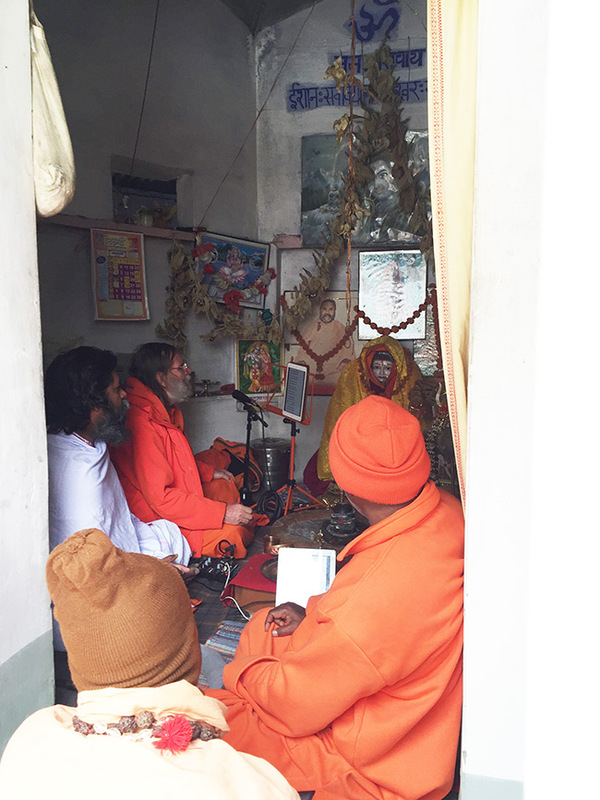 As questions were asked, it was apparent that, indeed, we have a lot to offer the sadhus of India – from ancient scriptures on an iPad App to the fundamentals of spiritual business and how to run an ashram, we can provide guidance and support. 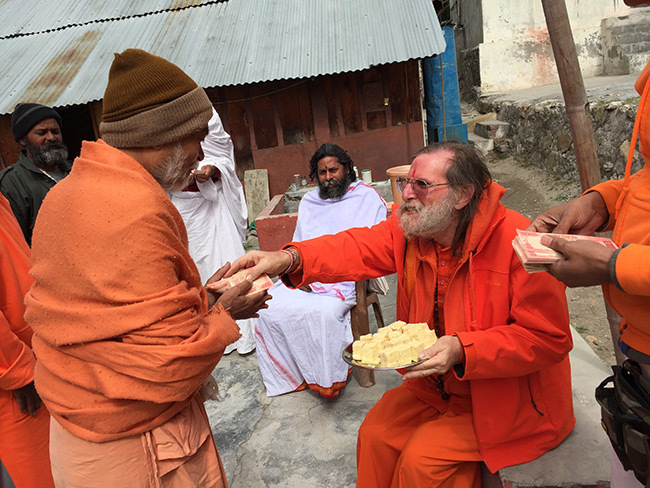 It was such an amazing experience to be able to perform sadhana together with those humble sadhus and to make an offering to them to help support their way of life. 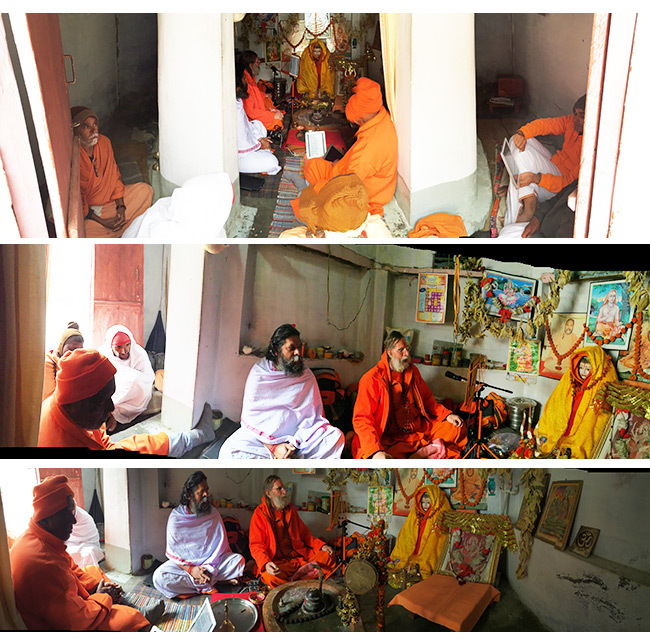 They invited us into their ashram with the greatest respect and truly appreciated our knowledge and example of sadhana. Before departing, they asked us to please come see them again the next time we are in India. Of course, it is our joy to visit such places where people’s minds and lives are dedicated to God!